"It's been years since we've done this together. It's incredibly exciting and promising. But I thought, oh my God, this could be amazing or this could be a catastrophe." A group of middle-aged musicians enter the studio to record some rock 'n' roll songs for a new album. This band does not fit the public image of a big time rock band, with their extra pounds, receding hairlines, and friendly, down-to-earth personalities. Don't be fooled, however, as they are all extremely talented and accomplished musicians. This is the E Street Band - the once-renowned backing band for Bruce Springsteen - and they've joined him for the first time since 1989 to record a batch of new, memorable songs. 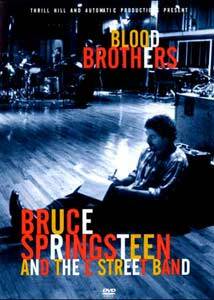 Blood Brothers documents the 1995 reunion of Bruce Springsteen and the E Street Band to record several songs for his Greatest Hits album. It originally aired on the Disney Channel in March 1996, and was subsequently released on VHS that fall. It has finally arrived on DVD, and this disc is sure to delight Springsteen diehards and convert a few new fans. Directed by Ernie Wells, it avoids the promotional approach and instead provides an intimate look at the recording process. It's interesting to note the tremendous amount of work that goes into the production of each track. Every element is continually changing in the songs until the final take. Bruce Springsteen's career has spanned four decades and includes numerous successful albums—peaking with 1984's Born in the U.S.A.—yet he appears on screen as a modest family man who just loves to write and play music. At one point, he postpones working on the demo for Secret Garden because he's taking his kids to see Beauty and the Beast. Out on the town, Springsteen drives his own generic car and signs autographs through the window. His sense of humor is engaging, and it creates an easy-going environment that resonates throughout the band. However, this does not lessen his relentless work to make the tracks perfect. When the songs are complete, a sense of true accomplishment resides in Springsteen's face, and this dedication shows in the finished product. A highlight of Blood Brothers is the filming of the live video for Murder Incorporated, originally recorded in 1982 and redone for this album. Shot at the Tramps in New York City, it recreates a live performance by the band with style. Directed by Jonathan Demme (Silence of the Lambs), the production presents a vision of the older, but still rocking E Street Band. The audience is obviously composed of huge fans and requires no prompting to go crazy during each take of the song. Afterwards, they return to play an actual set for the energized crowd. These scenes present the infectious nature of the band that exists throughout the documentary. Besides creating interesting music, they also lack the arrogance and two-faced nature often prevalent in popular groups today. The completed music video is included on this disc after the film. I enjoyed viewing the basic, day-to-day details of creating the greatest hits album. The camera follows meetings concerning the album cover, song selection, and decisions about the inclusion of strings on Secret Garden. Mundane details such as sending out the initial press release are interesting because they contain more than the basic actions. In this case, it's revealed that the release also exists to provide closure for the band, and this idea is compelling. Musically, the four tracks that ended up on the album—Blood Brothers, Murder Incorporated, Secret Garden, and This Hard Land—stand alone as impressive songs. It seems that artists today often add throwaway tracks to their greatest hits albums to inspire record sales. The promise of previously unreleased tracks is too much to pass up for the obsessive fan. In this case, however, Springsteen has written four excellent songs that could form the beginnnings of a separate album. The two standouts—Blood Brothers and Secret Garden—rank with some of his premier songs of past years. Secret Garden was featured on the soundtrack to Jerry Maguire, and its video is also included on this disc. The E Street Band contains a group of silly characters who all enjoy making music with Springsteen. Some of the film's best moments have little to do with the creation of songs for the album. The birthday party for saxophone player Clarence Clemons is a nice moment that shows how close they remain after all these years. Over the closing credits, they stand in a circle and enjoy the music, and this concludes a compelling look at a timeless band. Image Transfer Review: The original full-frame transfer on this disc features a grainy, realistic look often found in documentaries. This is especially evident during the outdoor scenes at night, which lack clarity and definition. I expect that Fritz purposely utilized this muddled appearance for this documentary, and the grain does not reflect a poor visual transfer. The grain is not evident on the two music videos, which both look excellent. Very few additional defects exist on the disc, and the black levels and colors appear solid and correctly proportioned. There's nothing amazing that occurs in the visual sense here, but this transfer basically succeeds in displaying the realistic look of the documentary. Audio Transfer Review: Blood Brothers contains a 5.1-channel Dolby Digital transfer and a 2.0 channel PCM audio mix, and both wonderfully convey the essence of Bruce Springsteen's music. The disc contains numerous segments and full-length versions of his songs, and they powerfully jump from the speakers into the room. The digital mix offers more depth of sound with the surround speakers, but either one complements the music nicely. The dialogue is slightly difficult to understand at times, but the problem does not reside with the transfer. Instead, Bruce often mumbles through his words, reinforcing the importance of the subtitle track on this disc. Extras Review: This documentary covers all aspects of the E Street Band reunion, so no bonus features exist on this disc. You could consider the two music videos at the end of the feature as extras, but technically they remain part of the main presentation. The menus on this disc for selecting chapters, subtitles, etc. are well done and contain segments of different songs on each screen. The overall presentation is excellent, and the lack of extra features is more understandable because of the self-contained nature of the documentary. I've never considered myself a Bruce Springsteen fan, but his songwriting abilities have always impressed me. However, after viewing this wonderful documentary and hearing the excellent songs, I plan to give him a closer look. Blood Brothers is highly recommended to anyone who loves music and wants to gain a closer perspective on its creation.